But the things have to still change under Microsoft. The telephones of Lumia maintain their designs coloured and they always run Windows Phone 8.1 . 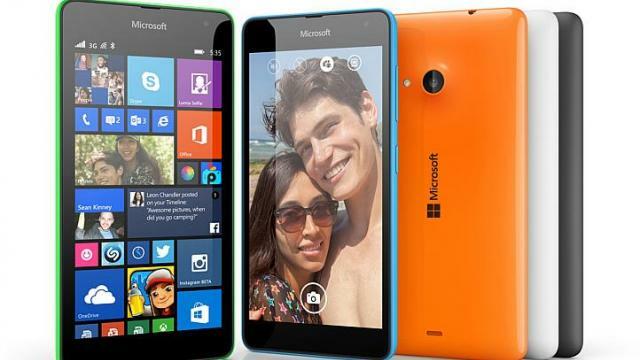 In fact, Lumia 535, available here since December, is the first telephone of Lumia to drop the name from Nokia. This is a budget phone, not a flagship model. Its design, typical of Lumia models, has a plastic back cover which can be swopped with similarly brightly coloured versions. A 5-inch screen dominates the front. Surrounding it is a surprisingly thin bezel. The device has a removable battery, a microSD card slot and two micro SIM slots, but it has only 3G connectivity. The microSD slot supports cards with a storage capacity of up to 128GB. This is a must-have feature as the Lumia has a miserly internal storage of just 8GB. Like those of many budget phones, its screen is not very good. While viewing angles are decent, the screen is highly reflective, probably because of the gap between the external glass and the LCD. Colours look washed out and the screen is easily smudged, though this is mitigated when I turn up the brightness level. In addition, the mediocre screen resolution (960 x 540 pixels) makes everything look slightly fuzzy. This includes photos that you take with its basic 5-megapixel rear camera. But at least the camera app felt snappy. As entry-level phones go, the $199 phone is not as attractive as the Xiaomi Redmi 1S. The Redmi offers a higher-resolution 1,280 x 720-pixel screen (albeit at 4.7 inches), a faster Qualcomm chip and an 8-megapixel rear camera for $169. The Redmi also supports dual SIM cards. Crucially, it runs Android, which has more than a million apps. To its credit, Microsoft has improved Windows Phone since my last experience with it. There is now a decent pull-down menu with notifications and quick access to settings. However, the variety of apps in the Windows Store, especially games, still lags behind Android and iOS. The battery of this Lumia will probably last you slightly over a day, depending on your usage. The first Microsoft Lumia is a decent budget handset which is unlikely to entice iOS or Android users to convert to Windows Phone.